The midseason premiere did not disappoint. "The Walking Dead" came back with its midseason premiere, "No Way Out," on Sunday -- and it was full of all the blood, carnage and shocking moments we've been waiting for in Season 6. First, let's get some stuff out of the way real quick. Daryl, Sasha and Abraham are fine. A group of men on bikes caught them at the beginning of the episode, but Daryl just blows them up with an RPG. Problem solved. Also, Carol finally killed the Wolf, shooting him as he tried to reach the infirmary with Denise to get treatment for a walker bite. OK, now the even crazier stuff. Carl Grimes has been shot in the eye. It's a moment comic fans have anticipated for a while -- and that we reported was likely coming -- but now it's finally here! It all went down as the group in Alexandria was trying to walk through the herd of zombies that had overtaken the town. They were all covered in zombie guts, holding hands and moving about pretty freely until Jessie's son Sam realized he has no business being alive on this show. He freaks out and gets eaten. Then his mom, Jessie, gets eaten, causing Rick to have to cut off her hand so she'd let go of Carl. Ron, clearly not liking any of this, aims a gun at Rick, only to be stabbed through the back by Michonne. Ron's gun goes off. 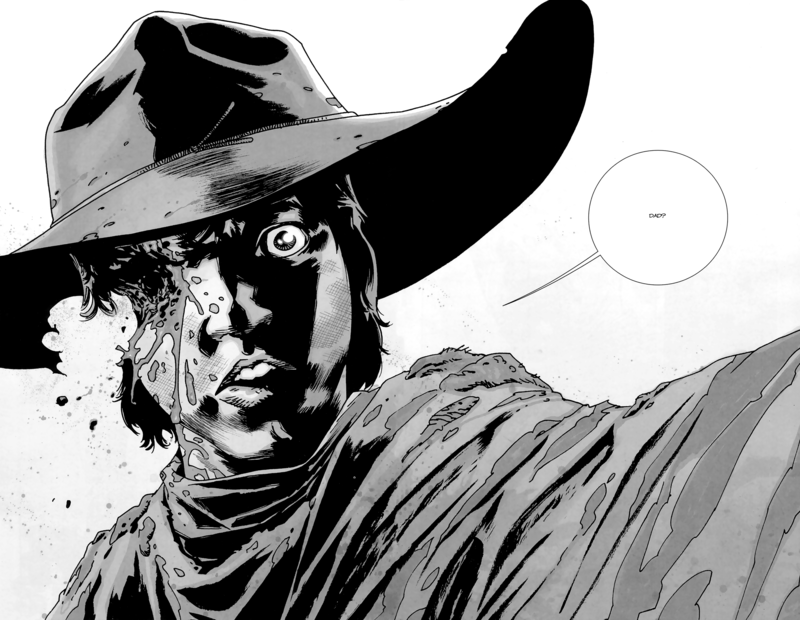 Then it's revealed that Carl's eye got shot out, and it looks even worse than if Ron had a Red Ryder BB gun. Rick gets Carl to the infirmary, and it looks like he's going to live. Glenn and Enid help save Maggie from the scaffolding she was stranded on, Abraham and Sasha then save Glenn from getting overtaken by walkers (thank gosh because it didn't look like there were any dumpsters to crawl under) and the survivors hacked their way through the zombies all night, setting up an intense second half for Season 6. Jessie, Ron and Sam were the major casualties, which Richonne (Rick + Michonne) fans should be cool with. "The Walking Dead" airs Sundays at 9:00 p.m. ET on AMC.